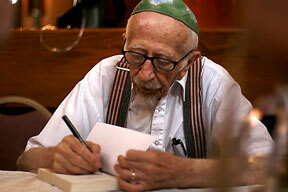 Remember Us -- the story of Holocaust survivor, Martin Small. 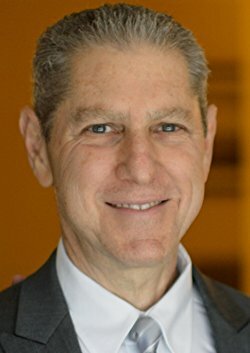 Last year I published two books about the mind and how it creates stress, happiness, illness, and health. The books are Stressing Out Over Happiness, and The Guidebook to Stress, Meditation and Happiness. My goal is to go far past the subject of the mind. This is why I wrote my latest book, 13 Thirteen Pillars of Enlightenment, which is a novel about self-realization and enlightenment. This book will take you on a journey into the mind as that which we call “I,” or the self, and then far beyond. It took me more than 60 years of research and a year to write this book. This new work is a short narrative that leads you to find the most mysterious and illusive aspect of life throughout the ages. It’s been called self realization, enlightenment, or realizing your true nature. Nonetheless these terms are relatively meaningless and can only point to what exists behind that which we call the mind, body, and reality. So I am hoping that this book can point you toward your own experience if that’s what you desire. My personal journey over many years led me to this realization, and my goal is to share the most fundamental tenets related to enlightenment. In the book I also go into the problem of language in trying to shed light on something that is beyond language, concepts, and images. Ultimately, I hope that you will be able to find out for yourself where thoughts come from, how they form the mind and the world that seems to exist, and how to discover the true nature of the Self. Posted on November 1, 2017 September 22, 2018 Categories BooksTags Ellie Roozdar, enlightenment, meditation, Nisargadatta, Ramana, self realization, Vedas, Vedic, Who am I? Letter from a reader of Remember Us. Thank you for sharing your personal letter! 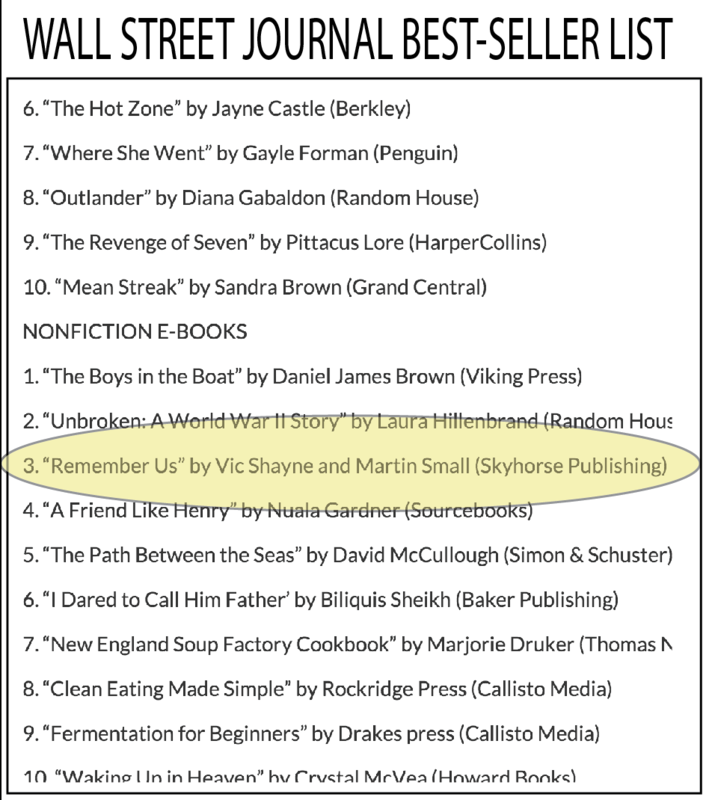 Thank you for reading experience with the the book “Remember Us”. I am just at the end of it and I must say it really is a moving story. There has been scary statistics presented in media here, how little the youth of Sweden know about this sad period of our recent history. As for my own family, on my father’s side, they had top pay a heavy toll; my grand father was a brave man who together with som friends organized escapes for jews and other persecuted people. They managed to get them out from Hungary to Romania through Transylvania where they lived. Ultimately, of course, Gestapo found out and my grandfather, grandmother (and unfortunately, my uncle, who was over from Budapest for the weekend) were taken away, never to come back again. My grandmother on my mother’s side, helped Jewish directors of their savings bank to get Swedish papers from Raoul Wallenberg, and I know that many of them made it to freedom. My grandfather though never came back from the Eastern Front, where hundreds of thousands of Hungarians lost their lives for a totally lost cause. My newest book, Stressing Out Over Happiness, is the culmination of several years of research and writing. It began as I was doing research for a novel (not yet published as of this writing) and I wanted to delve in to the protagonist’s particular sense of angst and trauma. As I was doing this, I thought that all this research would make a good book in itself — a nonfiction self-help book. Stressing Out Over Happiness is primarily about three things: Stress, Meditation and Happiness. It is a look at stress and happiness from the vantage point of several sciences, including psychology, neuroscience, biology, psychoneuroimmunology, and quantum physics. And, I bring into play the work and teachings of sages throughout history that now seem to be substantiated by leading-edge science. If you are stressed out or sick, this book will help you. If you are unhappy, depressed or anxious, this book will be great for you to read. If you wonder why self-help, positive thinking isn’t doing a thing for you, this book is perfect for you. If you are wondering about the meditation part of the equation, then let me tell you. There are two types of Buddhist meditation that have been studied at major universities in conjunction with happiness and stress reduction. I discuss these in the book. One is called mindfulness meditation and the other is loving-kindness meditation (also known as metta, or compassion meditation). While these are not the only types of meditation that are in existence, these are the ones that are most studied and have yielded empirical results. Within a week or so, a companion to this book will be released. It will cover some of the same material but a little more in detail and with a less formal and more exploratory angle. The idea is allow you to think about the subject matter and to stimulate your impressions and ideas. 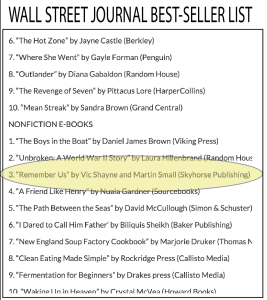 My nonfiction biography of concentration camp survivor Martin Small, Remember Us, has made it to two important best-seller lists, including Amazon’s Historical Biographies and the Wall Street Journal’s list. On the left is the Wall Street Journal listing. 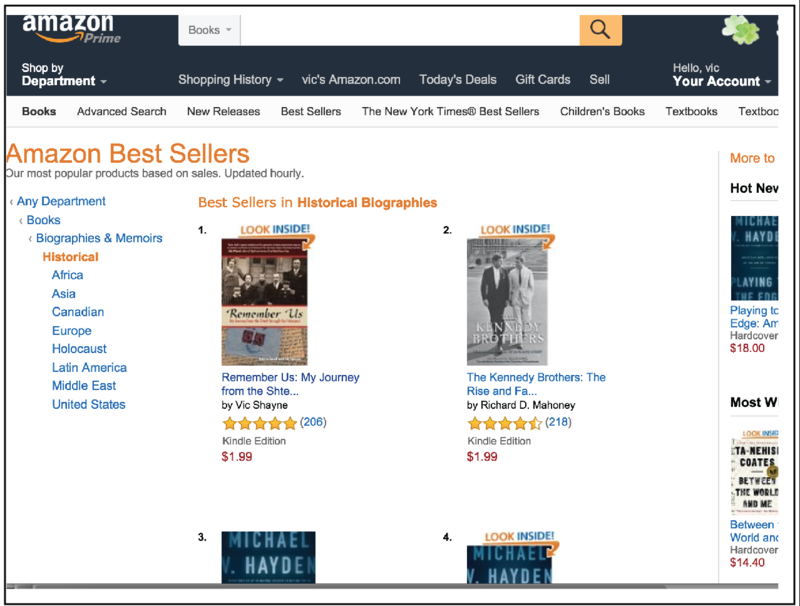 My book is number 3 under Nonfiction Books. 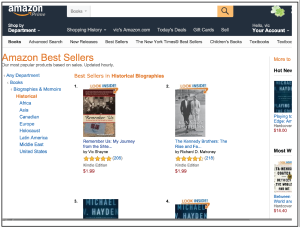 To the right is the amazon.com best seller listing where the book is in the first position. for over 20 years and know him to be a man with a strong conscience and one who does not compromise his values. 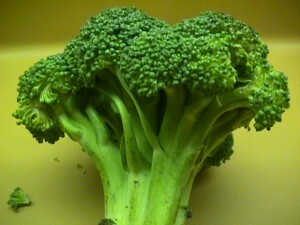 The Super Foods Diet is super for your health! Vic Shayne’s newest book, The Super Foods Diet, is out and available through amazon.com. This work is the culmination of more than twenty years of research in discovering which foods you should add to your daily diet that provide the most nutrition for a healthier you. The Super Foods Diet is all about eating specific foods in which scientists have discovered amazing biochemicals capable of healing sickness, preventing disease, supporting cellular function and maintaining optimum health. 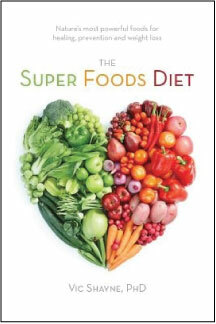 This book shows you how and why super foods are so essential for good health. A diet full of SUPER FOODS, while you avoid the junk foods known to the modern world, can take you out of the running for the most prevalent diseases of our era: cardio- vascular illness, diabetes, cancer, arthritis, Alzheimer’s disease, obesity and more. Illness isn’t a matter of genetics for most of us; it’s a matter of ignorance, exposure to toxic substances, poor dietary choices and abstinence from our planet’s most nutritious foods found right under our noses! Just released: the biography of WWII fighter pilot, Capt. George Lichter, an 91-year-old marvel. George Lichter’s story is fascinating, owing to more than just bravery. He is a risk-taker extraordinaire who joined up to fly in the Army Air Force the day after Pearl Harbor was bombed in 1941. 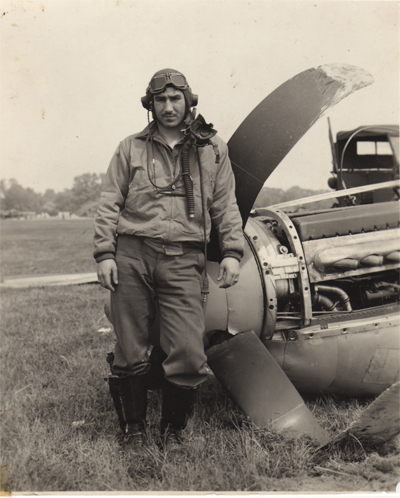 George Lichter was born in Brooklyn in December, 1921, to an immigrant family, became an athlete, signed up for duty at the beginning of the US involvement in WWII and went on to fly 88 combat missions over the skies of occupied Europe. He was stationed in Bottisham, England, with 361 Fighter Group and went home a decorated war hero at the end of 1944. But George Lichter’s story doesn’t end there. When every Arab neighbor decided to wage war against the new nation of Israel, 1948, George signed up for war again. He said he knew the Jews were outnumbered a million to one, and that the Arabs were promising to “finish what Hitler began,” but he just had to try to help. George was sent by the Israelis to Czechoslovakia to train the first Israeli Air Force cadets. Within months, the Israelis gained air superiority, ruled the skies over Israel, and won the war. George came away from the experience an Israeli national hero as a member of a few thousand Machal (foreign volunteer) fighters hailing from around the world. 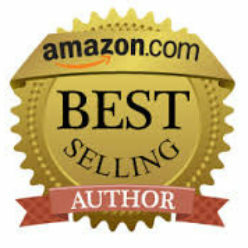 Entitled Ups, Downs and No Regrets, the amazing story of George Lichter is available through amazon.com by clicking HERE. The Self is a Belief is my latest book (2018, fall), and is a close-up loo k at the “I,” self, or egoistic mind, and how it is formed to create what we think is an individual self. For millennia sages of the East have been teaching about this false sense of self as the cause of most suffering. This is because the self identifies with the body and all sorts of objects and people. The mind is a tool that has evolved to separate all things by way of the five senses. It does this to differentiate shapes, sounds, textures, tastes, and so on. But when this mind becomes conditioned by myriad influences over a lifetime then it comes to apply this same separation to life for nonpractical purposes. And this is where the self, the egoic self, is born. This conditioned mind becomes attached to ideas, memories, situations, accolades, the body, and on and on. As such it presents a false image of the world and all that is contained within it. It loses the knowledge that it actually exists in one flowing consciousness and that nothing is separate from consciousness. In The Self is a Belief I bring in a great many voices to weigh in on this idea of consciousness, the self, and the problems that arise from this belief. You can read about yogis, sages, mystics, quantum physicists, neuroscientists, psychologists, and philosophers who all have something interesting to say on the subject. 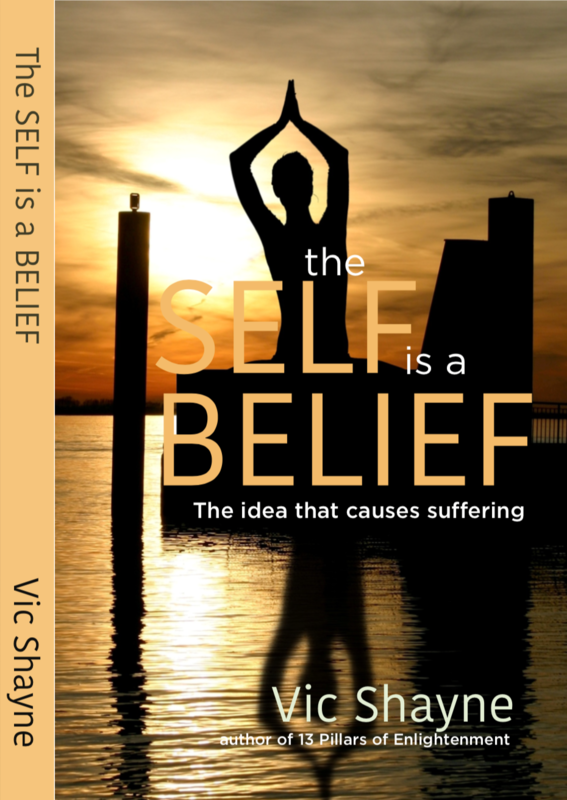 This book is based on my own personal findings, and at the end of the book, my wife Janice describes the process of self inquiry which leads to the realization that the self is only a belief. It is a practice that anyone can do if interested enough to uncover the ceaseless cycle of pursuing pleasure and avoiding pain. 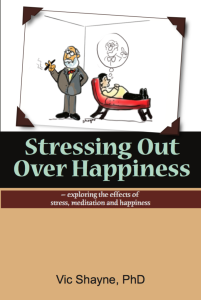 Stressing Out Over Happiness is a new self-help book that merges the wisdom of ancient sages, neuroscientists, psychologists, philosophers and quantum physicists to explore the nature of happiness, the physiological and mental aspects of stress, and how the mind works. 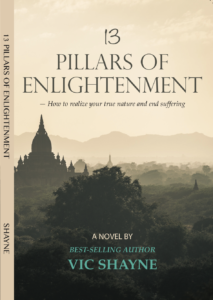 This book also delves into the two forms of Buddhist meditation that have been shown in university studies to lessen the effects of stress and lead to greater happiness. If you are stressed out (who isn’t), anxious, depressed or wandering in a daze, this book should prove very helpful to you. If you are a natural health practitioner, nurse, or therapist, you should read what this work has to say because there is definitely a missing link in today’s health care picture — a holistic paradigm. The mind is very complicated instrument. Or is it an instrument at all? The truth is that, despite our scientific effort, we are no closer to understanding the mind in terms of its shape, form or existence. We know it by its actions, but we cannot measure it or observe it except by means of its effect on the brain. To study the mind, we have to look into the nature of consciousness, and that is a big undertaking. In this book, though, we do just that. My hope is that this book will compel you to ask your own questions and explore the workings and nature of your own mind and your own existence. In the end, this should not only bring down stress levels, but it should also make you much happier. George Lichter’s story amazing adventures. 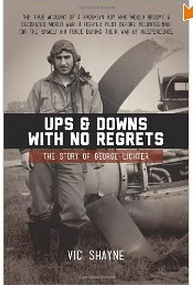 World War II veteran combat pilot Captain George Lichter who passed away at age 91, is the subject of a new biography called Ups and Downs With No Regrets. Ups and Downs, written by Vic Shayne, follows George’s life through his growing up years in Brooklyn where he was first smitten with dreams of flying while standing transfixed on the beach at Gravesend Bay watching a tourist plane take off from the surf. By age six, George knew he wanted to become a pilot, and when he saw the silent WWI movie Wings in 1927, he realized that flying combat would be the ultimate thrill. George’s dream came true in December, 1941 when the United States entered World War II. Pearl Harbor was attacked on Sunday, December 7, and George lined up to join the Army Air Force the next day. Ups and Downs is all about George, an athletic kid whose idea of fun always meant pushing his luck, taking crazy risks, and looking to try something new. These traits made him an ideal candidate for pilot training and air combat. In fact, his daring nature nearly got him killed on more than one occasion, including the time in 1943 when he and a fellow pilot decided to buzz New York Harbor and flew under the nose of the Statue of Liberty. By the end of the war, George had flown more than 88 combat missions over Nazi-occupied Europe. Though he crashed and had his plane shot full of bullets, George emerged from the war unscathed but highly decorated with the European Theatre Ribbon and four battle stars, battle stars for air war service and battle stars for flying combat during the invasion of Normandy (D-Day). Only a couple of years after WWII had ended, and trying to settle down in the business world, George discovered that the new nation of Israel was about to be attacked by its Arab neighbors on the even of being granted its independence by the United Nations. George contacted the Israelis and joined their war effort. But instead of sending him to fly combat, the Israelis had more important plans for him, not to mention that the Israelis had no fighter planes in service. They sent him to Czechoslovakia where the new Israeli pilots were to be quickly trained for aerial combat as an air force was being centered around remnants and spare parts from used WWII planes. Ironically, the Israelis’ first aircraft were reconfigured German Messerschmitts made in Czechoslovakia. Given his war record and exceptional piloting skills, George was chosen to be Israel’s chief trainer. Within months, the Israelis had put together an air force and took control over of their territorial skies to answer the bombing strikes of the Egyptian Air Force. During his tenure as chief instructor, George led a group of new fighter pilots through dangerous skies on a mission to bring Spitfires into Israel. For this perilous flight, rescuing a novice pilot lost in the fog near Yugoslavia and for his dedication, the nation of Israel recognized him as the one of the most treasured of their machal (foreign volunteer) military experts. Nancy Spielberg (Steven’s sister) is currently finishing a feature documentary on the exploits and service of the machal fighters, featuring George Lichter among the living pilots involved in Israel’s War of Independence, 1948. Ups and Downs With No Regrets features the favorable reviews of two celebrities — actor Jerry Stiller and television personality/author Dr. Ruth Westheimer, both of whom are personal friends of George Lichter. Dr. Ruth served as a sniper during Israel’s War of Independence. The book is not only about George’s war service, but also about his personal life, sexual exploits, stints as a trumpet player in college and in the Catskill Mountain resorts, battle with antisemitism, and world travels. Ups and Downs With No Regrets is the personal story of George Lichter written by Vic Shayne and available on amazon.com. Published 2013. 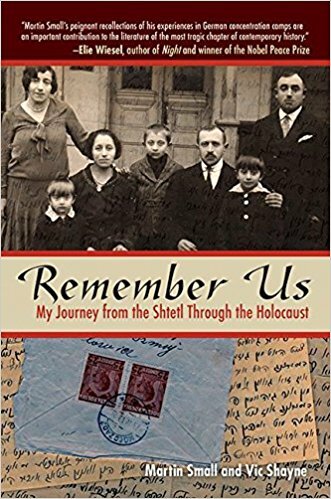 Shayne is also the author ofRemember Us: From my shtetl through the Holocaust, a first-person memoir of survivor Martin Small, 2009, Sky Horse Publishing. Remember Us is now available in book stores across the country. It has reached the amazon.com and Wall Street Journal best seller lists and has received wide acclaim. You can also order it online by clicking here for amazon.com. This book is the remarkable true story that begins in a world of Yiddish culture, bucolic countryside life in pre-war Poland and family relationships that were once the foundation of Jewish life. Living an idyllic life with family, friends and community, Martin Small was steeped in tradition, learning and culture only to be swept away in the storm of the Holocaust. His unchosen journey took him into a slave labor camp, into the forests as a partisan, into Mauthausen concentration camp, through displaced persons camps and further, all of which presented tests of body and soul. I spent an intensive three and a half years interviewing and talking with Martin Small, going through his documents and photos, and listening to him address audiences with his message of loss and redemption. The result of these years is this book, Remember Us, in which I wrote Martin’s life story in the first person. I invite you to read this book that has been heralded by Nobel Prize recipient Eli Wiesel, actor Jerry Stiller, actor/producer Ed Asner and many others, including veterans of World War II. Remember Us is available in bookstores nationwide, as well as online. Several years ago Martin Small, in his late 80s, approached Vic Shayne about writing his memoirs. Following a couple of initial meetings, Shayne decided that this project was well worth delving into for two main reasons. First, Martin Small was an outspoken and fascinating subject. Second, his story was literally a hero’s journey. When you read Remember Us, Martin Small’s story, you’ll see that he started out in life speaking three main languages: Yiddish, Russian and Polish. By the time he was five he was speaking and reading Hebrew as well. After the war, which is a period of great wonder, as covered in the book, Martin Small took a train to Italy from Salzburg, Austria, as thousands of Italian POWs were returning home from Russia. Instantly making friends with an Italian officer, Martin at last made it to Rome and in no time was speaking like a native. He made plenty of friends from Anzio to Ostia to Turin and back. The hero’s journey finds the hero, by the end of the journey, a changed and wiser individual who sees the world in a new light. Nothing could be more true of Martin Small’s journey from his shtetl in Poland to the concentration camps of the Nazis, wandering as a displaced person after the war, into Italy, and beyond. 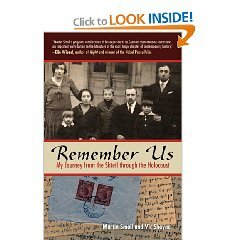 Remember Us: From my shtetl through the Holocaust is available for purchase through amazon.com online by clicking here. 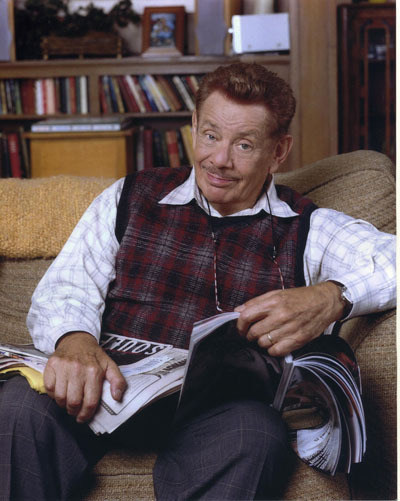 Jerry Stiller, well known for his role on the Seinfeld TV show, among others, recently wrote to Vic Shayne in praise of Remember Us, the story of Holocaust survivor Martin Small. Stiller’s family is from Frampol, a Polish shtetl, and he said that the account of Martin’s life in his own shtetl gave him pause to think about his roots. As an eighteen-year-old G.I. stationed in Italy in 1946, part of the Army of Occupation, I was invited to attend Rosh Hashanah services in a Naples Synagogue by Jews who were awaiting resettlement by the Joint Distribution Committee. When the service ended a family invited me to their flat for dinner. I remember them to this day. The father, mother and their little daughter. I bought her a doll. We finished supper and talked. They didn’t say much about how they managed to survive. As a young Jewish kid from New York I was aware of how lucky I was to have experienced that moment. When dinner was over I left them some lire and said goodbye thinking I’d never see them again. Two years later I was a civilian riding a bus in N.Y.C. looking for a job. A man got on the bus and in Yiddish asked the driver for directions. The driver didn’t understand Yiddish. I took it upon myself to translate. Suddenly the man’s face seemed vaguely familiar. In a few seconds I realized he was the man who invited me to dinner in Naples. My mind was blown. We talked and he told me he and the family were relocated to America and were living at 61 Columbia Street on the Lower East Side, the same tenement my mother lived in when she arrived in the United States. “We still have the doll”, the man said. I could not believe this was happening. These are the stories your writing ignited in me. Of course it parallels the story about Mr. Curry, the policeman Martin Small met in New York who he had first met as a G.I. at that horrible camp. Early in our marriage Anne and I lived in Washington Heights. Most of the tenants were survivors. Each night they would sit in beach chairs on Upper Riverside Drive conversing. Being inquisitive I would sit close enough to hear them tell stories about their lives. At the time they called Washington Heights the “Ferte Reich”. “Remember Us from my Shtetl” also put me in touch with Frampol, a town in Poland my mother came from probably not unlike Maitchet. Your description of the town opened my mind to what my mother’s life was probably like as a young girl in the town of Frampol, which she never spoke much of.